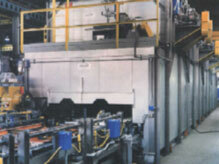 The oven shown is a COLEMAN® JET-ACTION® CORE WASH DRYING OVEN. Supplied to a major automaker, this gas-fired oven is a part of an automated core dipping, drying and assembling operation. The oven is capable of drying 144 corepacks @ 280 lbs. each, per hour (40,320 lbs. per hour). This is a (4) four zone, 500°F oven with a fully automated indexing conveyor, providing precise (±.020") core pallet positioning for automated core package loading and unloading. The oven overall dimensions are approximately 84 feet long X 13 feet wide X 16 feet high. The length of the conveyor as shown is 174 feet.